Patient safety and convenience, as well as professionalism and high quality care are top priorities. Additionally, we manage pain with the best methods available, so that your experience is as comfortable as possible. 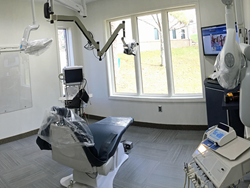 Dr. Russell Kiser relocated his dental practice to a new, fully renovated facility. The first day in the new facility was Monday, February 29, 2016. Dr. Kiser, a practicing specialist and dentist, planned and managed every part of the renovation and move. The overall objective was to provide caring and professional dental care in an easy-flowing environment designed for serving dental patients with good accessibility. The first difference you see at the new location is there are better parking spaces, compared to the former location. There are no steps and there is no need for a ramp at Building A, 1221 S. Trimble Road, since it is 100% handicapped accessible. Inside, it is a clean, organized and welcoming atmosphere. Reception is welcoming and comfortable. The clinical areas are well designed with modern technologies so that the hygienists and the doctor can optimally serve patients needs. Some things have not changed. Dental options continue to be provided upfront. Dr. Kiser always listens to his patient's needs and concerns in order to make personalized recommendations for a specific plan of treatment. ABOUT ADVANCED DENTISTRY AND DENTAL IMPLANT CENTER OF MANSFIELD OHIO: Dr. Russell Kiser is an endodontist specialist and practicing general dentist with many years of experience in the field of dentistry, restorative/prosthetic care, dental surgery, and implant surgery.